Back cover blurb: This is a fact: Ryan Summers walked into Three Rivers College and killed thirteen women, then himself. But no one can say why. The question is one that cries out to be answered - by Ryan's mother, Moira; by Ishbel, the mother of Abigail, the first victim; and by DI Helen Birch, put in charge of the case on her first day at her new job. But as the tabloids and the media swarm, as the families' secrets come out, as the world searches for someone to blame... the truth seems to vanish. A stunningly moving novel from an exciting new voice in crime, ALL THE HIDDEN TRUTHS will cause you to question your assumptions about the people you love, and reconsider how the world reacts to tragedy. Ryan Summers killed THIRTEEN women before turning the gun upon himself. The opening pages of this novel almost read like an american thriller, and then you realise that you are in Edinburgh, Scotland, with relatable characters and chilling detail, and it becomes a very different opening. Three Rivers College is under attack from a lone gunman, college student, Ryan Summers. Abigail Hodgekiss is Ryan Summers' first victim. Her Mother is determined to find out. Told from three very differing perspectives; Ishbel Hodgekiss, Abigail Hodgekiss' Mother, Moira Summers, Ryan’s Mother and newly promoted DI Helen Birch, all the hidden truths is a complex character study that really allows the reader an insight into all aspects of the horrific shooting. What makes someone take someones else's life? How do you live with your child's murder? How do you live with your child being a murderer? So many unanswerable questions, yet this author does her best to answer them in this though provoking novel. 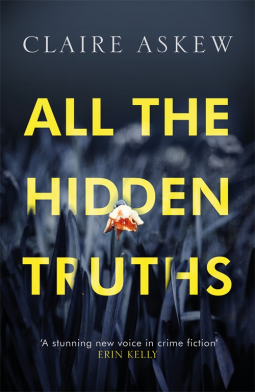 All the hidden truths is an amazing debut that will leave you contemplating the novel a long time after you've finished it. Available now via Amazon online and all good book shops.